The Bible is full of stories of faithful men and women. They are truly examples of prevailing faith through trials and tribulations along the journey of life. I love to imagine what these men and women were feeling and thinking during these testing times of faith. I often write their stories in first person as the Lord leads. One of my favorites is the story of Joseph, the son of Jacob, grandson of Isaac and great grandson of Abraham. The Lord has given Joseph to me as a special assignment and over the past six years, I have studied him relentlessly. 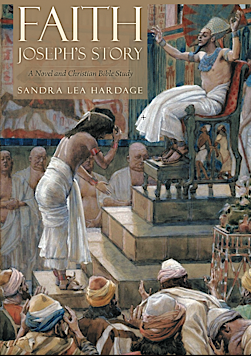 As a result of the study, I have written a book FAITH Joseph’s Story, a novel and a Bible study. You remember Joseph’s story, don’t you? His story is found in Genesis 37-50. Joseph was the oldest of two sons born to Rachael and Jacob. Joseph’s birth was the long awaited child of Jacob’s most loved wife Rachael. Rachael had been barren for many long years, while her sister Leah produced many sons for Jacob. Talk about sibling rivalry! As the story goes, Joseph was the favorite child of Jacob and received preferential treatment from his father. Jacob even gave Joseph a very special coat to show him how much he loved him. This coat was so beautiful and one that indicated to the others that Joseph would receive the coveted birthright. They became jealous. Then God gave Joseph two prophetic dreams that would remind Joseph of God’s care in the years to come. Both dreams involved the brothers bowing down before him and the last dream included his father and mother doing the same. Joseph told his brothers and father about these dreams and the brothers’ jealousy was stirred even more. How dare Joseph think he is better than his brothers! Jealousy soon caused the ten brothers of Joseph to hate him so much they had the desire to murder him. It wasn’t long after the coat of many colors and the prophetic dreams the brothers took matters into their own hands. “My brothers’ jealousy grew worse. They became very bitter toward me, so I stayed close to my father as often as I could. This made them all the angrier. If I walked up to them, they would turn from me or make jokes about me and laugh. I thought they would get over their jealousy because we were family, but I was wrong. Instead, everything grew worse. I didn’t know exactly how much my brothers hated me until one day, on my father’s orders; I went to check on their progress tending sheep. They had taken the sheep to Shechem, which was a long distance from our tents, in search of good pastureland. I traveled to Shechem but did not find them. I was directed to Dothan where better pastureland provided more grass for the sheep. Perhaps it wasn’t the best idea to wear my beautiful coat while searching for my brothers, but it was cold and windy. They saw me in the distance, and the sight of my coat kindled their hatred. As they spoke to each other, their hatred grew. Soon they devised a plan to kill me and dispose of my body in a nearby pit. Telling my father would be the tricky part, so they decided to tell him an animal had devoured me. We can glean many personal “take-away” lessons from this portion of Joseph’s life. Partial treatment for any child in your family can have disastrous results. They may not plot murder toward this child but the relationship the children have for each other may not survive childhood. Treat children fairly. You are teaching them to respect each other as well as learning how to treat others. They learn this from you and the way you treat family. Be conscious of any preferential treatment or gift giving toward one child. Yes, some children’s needs are greater than another child but be aware every child also has needs of their own. Sometimes a little hug or kiss goes a long way. Love them unconditionally. Teach them to love like Christ. Discipline the wrongful act and let the child know why they are being punished. Make sure you let them know you still love them. Don’t just say it. Show them with a warm embrace and the words “I love you”. Remember, Jesus disciplines us because He loves us. Jealousy and sibling rivalry ran rampant in this family as well as lies and deceit. Jacob and Esau pitted against each other as children for the love and affection of both parents. Rachael and Leah were competing for Jacob’s love and attention as wife and mother of his children. Be open and honest with your family. Don’t try to hide the truth from them. They will hear everything you say anyway. When you explain the truth to them, make it age appropriate and easy to understand. Sometimes they may ask a simple question that deserves a simple answer. For example: Child’s question: Where did I come from? What you hear: (the dreaded question)Where do babies come from? Child’s real question: In what hospital was I born? Do not cause your children to compete for love. Shower all your children with love and affection. Let them all know you love them. Be aware that family traits can be passed down from one generation to the next. Also be aware that Jesus can change any traits you have by His love and grace. That includes behaviors from family or ones you develop on your own. Love unconditionally as Christ loves you. Joseph’s father Jacob had issues of his own from childhood when his father Isaac’s favorite son was Esau. It is apparent that he didn’t learn much about favoritism. But in spite of human error, God’s plan was at work. God had a plan for Joseph’s life. It was revealed to him in these two dreams when he was seventeen years old. Dreams that would be fulfilled many years later in a country named Egypt. This was the fulfillment of a God-given promise by YHWH Himself to Abraham as part of the covenant promise.